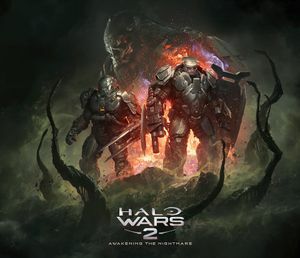 Halo Wars 2 : Awakening the Nightmare is a digital expansion for Halo Wars 2. It features a new campaign and a new cooperative mode known as Terminus Firefight. In addition, Awakening the Nightmare also added two new Banished multiplayer leaders (Pavium and Voridus) and two new standard multiplayer maps, the latter of which was also made available to those without the expansion. The expansion was released on September 26, 2017 for $19.99 USD on Xbox One and Windows 10 PC. It is not included with the Halo Wars 2 Season Pass, but is included in the Halo Wars 2: Complete Edition. Awakening the Nightmare takes place in June 2559, several months following the events of the main game. Like the main game, Awakening the Nightmare is set on the Ark, though this time set around the remains of the Covenant city High Charity, which crash-landed on the Ark in Halo 3. Due to the lack of an active monitor on the installation, the Ark's defenses were only able to establish a quarantine zone around the infected city, like the one established on Installation 05. Unlike Halo Wars 2 and Operation: SPEARBREAKER, Awakening the Nightmare is set entirely from the point-of-view of the Banished, and is the first time in the series' history in which players can fight UNSC enemies. The primary characters of the campaign are the Jiralhanae brothers Pavium and Voridus, who are tasked by Atriox to investigate and salvage the Covenant holy city for useful equipment. The quarantine shield protecting High Charity. Several months following the events of Halo Wars 2 and Operation: SPEARBREAKER, the forces of the UNSC Spirit of Fire and Atriox's Banished are still locked in a bitter stalemate on The Ark. With the loss of Enduring Conviction, Atriox is still cut off from receiving supplies and aid from his forces in the Milky Way galaxy. To remedy this, Atriox looks to the ruins of the Covenant holy city High Charity - which had been captured by the Flood and crashed onto the surface of the Ark in the final months of the Human-Covenant War - as a potential source of weapons, vehicles and supplies. Atriox tasks two of his lieutenants - brothers Voridus and Pavium - with scouting out the structure and scavenging any useable supplies they can find, but with strict orders not to enter the ruined city. Due to abuse of the Ark's systems by both sides of the conflict, the structure's defense systems are now hostile to humans and Banished alike. While Banished troops on the ground find modest amounts of supplies, Voridus leads his troops directly to the quarantine perimeter of High Charity, using his Scarab to cut through the energy shield. 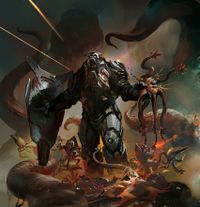 Believing the stories of the Flood infection to be Covenant lies and myth, Voridus deactivates the Sentinel defenses in the region and orders a squad of brutes to scout out the interior of the structure. However, the trio are rapidly infected and turned, spurring a massive Flood counterattack as the parasite escapes the ruins of High Charity and into the surrounding landscape. Atriox stands before the Proto-Gravemind. In response to the quarantine breach, Pavium prepares several waves of defenses, establishing several defensive perimeters in which to fall back while Goliaths clear pathways for Banished forces to fall back in. However, all defensive efforts fail and eventually Pavium is forced back to his main Outpost. Meanwhile, Voridus and his men manage to retreat and fine a nondescript Forerunner structure. While Voridus attempts to reactivate the defenses in the region, Pavium comes up with a plan to stay the Flood's advance - at least temporarily. Fissures in the landscape are honeycombed with explosive power, which the Banished could potentially use to catalyse a chain reaction, burning the Flood away. Pavium sets up a mining facility, eventually able to dig into the crystals beneath the surface and start the reaction necessary - however, the Flood senses this threat, and begins sending much stronger forms against Banished forces. With the Flood scourge burned away, Voridus is able to enter the Forerunner structure and find a way to reactivate the Ark's defenses. Fighting through Flood, Voridus is eventually able to reactivate the defenses, in time to hear news that Atriox has dispatched Banished reinforcements to assist in quarantine cleanup measures. Atriox proceeds to scold the two brothers, informing them that their recklessness has cost him several major fortifications as he must now reroute troops away from fighting the UNSC to deal with this threat, warning that if the situation is not dealt with by the time he arrives personally there will be grave consequences. Pavium and Voridus begin a centralised effort to fight back against the infection, but soon find their path blocked by a massive tentacle. Pavium commissions a Mega turret to deal with the threat, but soon realises that the tentacle is but one extension of a gargantuan Proto-Gravemind - if allowed to finish growing, the Flood would be unstoppable. Thanks to coordination by artillery, orbital support and ground troops, the Proto-Gravemind is killed in time for Atriox to arrive and inspect the scene himself. Once again, he scolds the two brothers before ordering them back to base to clean up. As Atriox inspects the remains of the Proto-Gravemind, Sentinels begin swarming into the area to cleanse it of all infection. Campaign menu background for Awakening the Nightmare. The Awakening the Nightmare campaign, which includes new bookend cutscenes by Blur Studio, takes place a few months after the main game. The story explores the Banished and their desperate struggle against the Flood, which survived the conflict on the Ark and the activation of the replacement Halo at the end of Halo 3. The Awakening the Nightmare campaign has five missions. "What Could Go Wrong?" - "Voridus launches a Scarab assault through Sentinel-heavy territory to break into High Charity." "Fighting Retreat" - "Pavium and his troops prepare an exit route to extract High Charity salvage." "Light the Fuse" - "Pavium must rescue Voridus and clear a path to the Forerunner structure nearby." "The Archive" - "Voridus desperately seeks a way to reactivate the Ark's sentinel defenses in an effort to stop the spread of the Flood." "Manifestation" - "Voridus and Pavium must assist the Ark's defenses in a final push to contain the Flood threat." Aside from the campaign, the expansion also includes a new mode called Terminus Firefight. In the new mode, up to three players can cooperate in defending their bases and a Forerunner Terminus node against waves of hostile UNSC, Banished, and Flood forces. The mode, as well as the new leaders, was playable at the 2017 Electronic Entertainment Expo. Terminus Firefight can only be played on one map, The Last Bastion. Aside from the campaign and firefight, Awakening the Nightmare also grants accessed to two Banished leaders - Pavium and Voridus. Pavium is granted access to the Mega turrets, the Wraith Invader APC and focuses largely on a defensive playstyle, while Voridus' abilities focus on the use and combo of Infusion gel. Alongside the expansion's release, a free update was rolled out to all Halo Wars 2 players which included two new maps - Fissures and Mirage. Thumbnail concept art of the Flood. Awakening the Nightmare's E3 2017 keynote art.